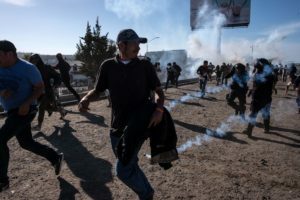 The U.S. has continued to dismiss criticism over its use of tear gas on a group of asylum-seekers in Tijuana, saying the “chaotic” weekend of border clashes were “predicted” by President Donald Trump and immigration officials. The incident, Trump officials said, justified the administration’s recent shoring up of security at the border. 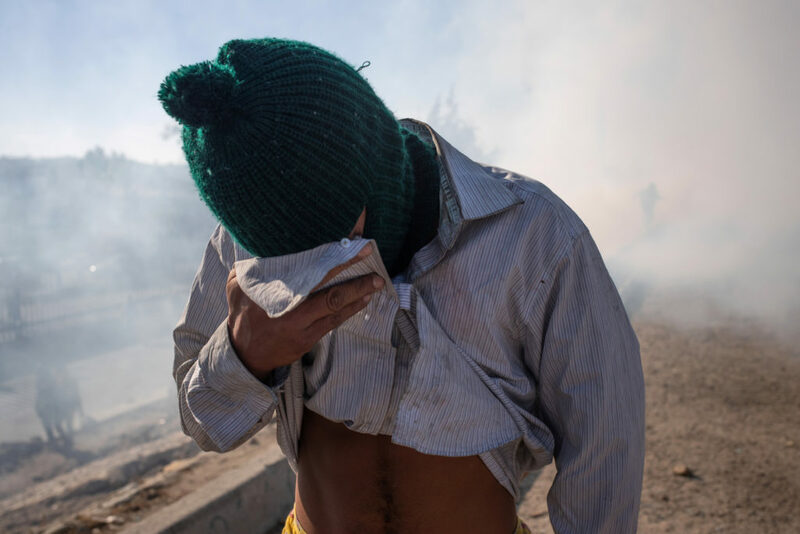 Still, pressure from human rights groups continues, and Mexico’s ministry of foreign affairs requested that U.S. authorities thoroughly investigate the use of non-lethal weapons in the border area of Tijuana and San Diego. Here’s how the Trump administration is defending the use of tear gas by U.S. border agents, what we know about the migrant caravan, and what’s next for asylum seekers along the border. On the day of the clash, hundreds had joined a largely peaceful protest that ended up outside the port of entry to air their frustrations about the long wait times for processing their asylum claims. Houlton also defended the use of tear gas by pointing out how often this method is used by U.S. law enforcement to control unruly crowds. “If the same thing took place in a large American city during a violent protest or riot, the press and politicians would be praising the work of law enforcement for restoring order and keeping the peace with no injuries,” Houlton said. On Twitter, several Democratic lawmakers criticized Border Patrol agents’ methods to disperse the crowd, arguing that women and children were caught up in the turmoil. Mexico’s own official count of migrants who attempted to cross into the U.S. placed the number closer to 500. In all, U.S. officials said there are about 6,000 Central American migrants waiting in Tijuana, part of a northbound caravan group that has for weeks traveled by foot to seek asylum in the U.S. Both American and Mexican officials estimated that there are another 2,000 or more migrants located in nearby Mexicali. Houlton said the group that clashed with U.S. and Mexican agents was mostly male and throwing projectiles, including rocks and concrete, at authorities. U.S. agents then targeted “violent men” who were hitting officers with the objects, “destroying” federal property and trying to illegally enter the country. Houlton added that those who “willingly joined a violent mob committing federal crimes may have been affected by the tear gas unintentionally,” a nod to the women and children also affected by the tear gas. It was Border Patrol agents’ professionalism and training that made sure no one was “seriously injured” during the clashes, Houlton said, echoing arguments made by Homeland Secretary Kirstjen Nielsen in a long Facebook post on Monday. The Trump administration, including the president himself, have made several assertions about the caravan, including that it is mostly made up of men who have criminal records. But the officials in Tuesday’s call would not say on the record on how they know this to be fact. Nielsen, in her Facebook post, said DHS has confirmed that there are more than 600 convicted criminals, known to authorities for a variety of serious offenses, traveling with the caravan. She did not provide evidence to support that assertion. When DHS was asked about how the federal government knows this number on Tuesday’s media call, officials declined to answer, saying the details are “sensitive” and cannot be released publicly. Sarah Pierce, a policy analyst for the Migration Policy Institute, told the PBS NewsHour that the administration’s defense of the U.S.’s actions at the border are “very consistent” with how U.S. officials have been framing the migrant caravan issue and entries at the southern border. “The administration has really disregarded the fact that there might be legitimate asylum-seekers in this group and kind of painted them overall as a group of individuals that are seeking to take advantage of U.S. immigration laws,” she said. Nielsen, in the same statement, also said the “limited number” of women and children in the caravan are being used as “human shields” during confrontations with authorities. “They are being put at risk by the caravan organizers as we saw at the Mexico-Guatemala border. This is putting vulnerable people in harm’s way,” she wrote. This was also presented without evidence. But it echoed the picture Trump painted at a roundtable event on Monday in Biloxi, Mississippi, where he said there were “grabbers” within the caravan, who grab children to better their chances at crossing the border. Such people “think they’ll have a certain status by having a child,” the president said. It’s not immediately clear if this is true or how DHS knows this. Pierce of MPI said the way the U.S. determines whether or not a migrant is coming for economic reasons or for asylum is by adjudicating their claims. The Associated Press previously reported that the San Ysidro center is processing fewer than 100 claims a day, while thousands wait for their chance at asylum. Pierce said she doesn’t know how the administration could know with any certainty that these are economic migrants or asylum-seekers. She also said that a migrant with a legitimate asylum claim could also be coming to the U.S. for economic reasons. “It does not matter if a migrant is interested in coming into the United States for economic reasons so long as they have a well-founded fear of persecution on account of race, religion, nationality, membership in a particular social group, or political opinion,” Pierce told the NewsHour. “If they fall into that legal definition then they qualify for asylum in the United States, regardless of their economic condition,” she said. 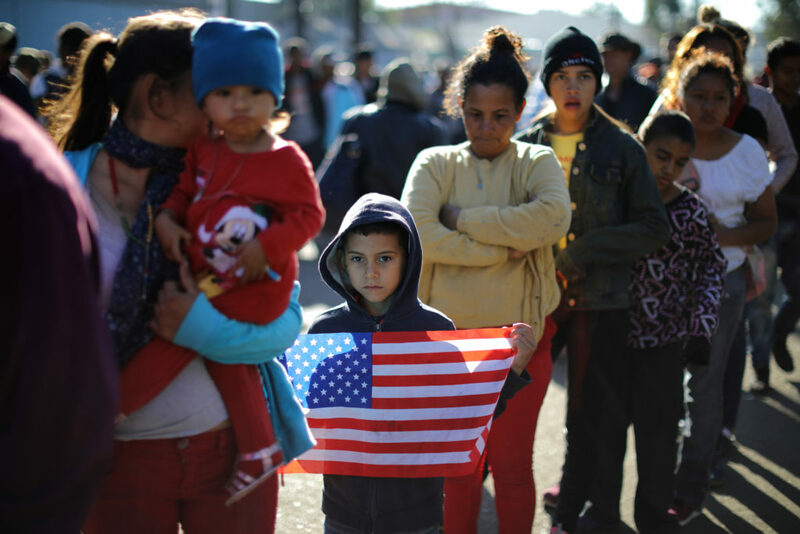 Scott Shuchart, a senior immigration fellow at the Center for American Progress, joins Amna Nawaz to discuss the administration’s recent moves on asylum. No matter the goal of the majority of migrants, the Trump administration has been trying to make it more difficult for people to seek asylum in the U.S.
Trump signed a proclamation earlier this month that sought to deny asylum to migrants who attempt to cross into the U.S. between ports of entry. Those new regulations were quickly challenged in court, and a federal judge enjoined the new asylum rules, pending a final ruling on the matter. Houlton said the U.S. has been in “constant dialogue” with Mexican officials about the caravan. Mexico’s ministry of foreign affairs has requested that U.S. authorities thoroughly investigate the use of non-lethal weapons and what transpired in the border area of Tijuana, San Diego. While local officials in Mexico said they’ve been struggling with accommodating the thousands of migrants waiting in their cities, the Mexican government has pledged a bigger law enforcement presence at the border and said it would ready deportations for migrants it has identified as trying to “violently” enter the U.S.
U.S. and Mexican officials plan to meet next week, according to White House press secretary Sarah Huckabee Sanders. Mexico will also inaugurate President-elect Andres Manuel López Obrador (known as AMLO) on Saturday, and U.S. Secretary of State Mike Pompeo intends to meet with Mexico’s new foreign minister the next day.